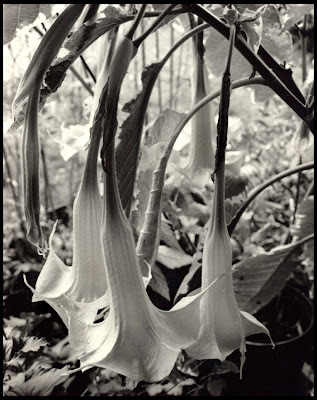 Brugmansias and daturas are tropical plants with spectacular, funnel-shaped flowers as much as a foot long and eight-inches across, ranging from scarlets to pale purples to brilliant whites (like these). These flowers were about eight-inches long and five inches across, taken on a shaded patio with the light behind them. This particular image won a photo contest in the Portland Oregonian and was published, and a collector contacted me and bought a print. To my mind, I think one of the things that gives this plant an unusual mystique is that all parts of it are powerfully hallucinogenic and, in too high a dose, deadly. Of course, you can't see that in a photograph, but the plants have a weird kind of energy about them and a peculiar musty odor that, depending on the person's taste, is disagreeable or fascinating. The blossoms themselves give off quite a sweet scent at night. Tech: Canon T-90, Ilford Delta 400 film, DDX developer, printed on Ilford RC Warmtone and selenium toned.